Wong Cho Lam challenged himself with a musical for his directing debut. The film was even scheduled for a Lunar New Year release. Although his daughter Gabrielle was just born, in order to promote the film he would not even have Lunar New Year off as he would have to attend audience appreciation events to pump up the box office. His wife Leanne Li Yanan would be responsible for getting lai see for their daughter. Then on their wedding anniversary, he and his wife Li Yanan would relax a little with a vacation for two. This Lunar New Year to Wong Cho Lam absolutely would be a special one. Aside from his daughter Gabrielle being born, his directing debut I LOVE YOU, YOU'RE PERFECT, NOW CHANGE! (NEI MAI LEI, NGOR OI NEI!) was arranged for a Lunar New Year release. Thus he would not get the Lunar New Year off as he would have to promote hard for the film. 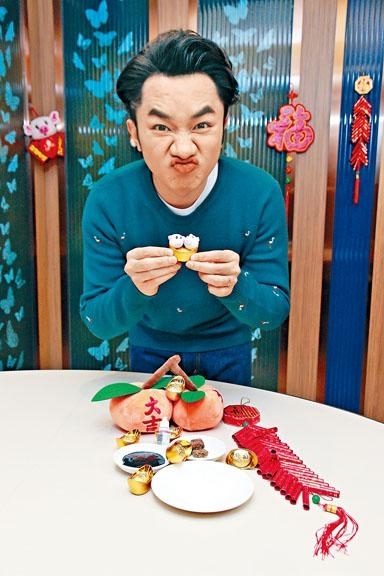 However, earlier he took time to cook as he personally made piggy tangyuan to celebrate the Year of the Pig. Actually he had a way with tangyuan making, he attentively made the pig ears and snout and the finished product looked right. He pointed out that this year with a new addition to the family he felt life was even more perfect. However he has been always with work all along, even for Lunar New Year he would not be able to spend time with his wife and daughter. He said, "Earlier I just studied my schedule with Yanan to find out how many days I would be at home during the New Year. Because I have a movie release and would have to attend audience appreciation events nonstop, I can only send Yanan to get lai see for our daughter. Then for our wedding anniversary on February 14th Valentine's Day, I will go on vacation with Yanan, just the two of us. Mommy would take care of our daughter." As for leaving their newborn daughter to go on vacation, Cho Lam said that he even was reluctant he had to. Yanan needed the "release". He said, "Yanan gave birth via cesarean and took half a month to recover. She couldn't eat anything. Actually during the month long maternity rest she could go out, so she already planned when she could go out and have fun. However when she wanted to go, I was either busy with post production or with promotion. So we have to wait until Valentine's Day to celebrate all at once. After the holiday we will continue to work. This New Year is very special, I used to give lai see and get nothing back. This year since I can get it back I will get it back in full. (If you have a few more you can get more?) This year the interest starts, after a few more I can make back cost, haha." Speaking of directing for the first time, Cho Lam stated that he was anxious. This year many Chinese Lunar New Year film suddenly appeared, but he was very happy that the audience would have even more choices. Was choosing a musical for his directing debut very risky? He said, "Absolutely it is, but I feel for the first time I have to find a subject I like and at the same time I can answer to investors with. They gave me a lot of suggestions, so the film got a Lunar New Year release. All star song and dance in a serious production has their advantages, in the past Chinese musicals' results have been lacking. Few had high box office take, but this time was a comedy. I felt I could let go and take the gamble, to make a musical that belonged to Hong Kong. The last Hong Kong musical would have to go back to the black and white era, the most recent was PERHAPS LOVE (YU GOR OI) but that wasn't a pure musical. We even sang the lines, it was a musical film that belonged to this generation of Hong Kong people." Cho Lam admitted that directing this time was very stressful. He did not know that whether viewers would like it, was afraid that he was too extreme and would make investors lose money. Thus this performance would determine whether he would keep directing.